A refreshingly bloat-free app, Wave Editor's sensible, streamlined approach is certainly its strength. Customisable workspace. Flexible layers system. Supports many formats, including DDP. Excellent integrated support system. Affordable. No included effects. Not the most in-depth editor available. The humble wave editor is rarely cause for much excitement, but when it comes to performing a quick edit, a bit of offline mastering or file conversion tasks, a DAW can be overkill - just loading the thing up can be a time-consuming distraction. This is where software like Wave Editor comes in. It hails from US developer Audiofile Engineering and is a Mac-only application built from the ground up in OS X's Cocoa. Designed for file editing and CD mastering, Wave Editor has some pro features that you wouldn't expect at this price point, such as DDP (more on which later), to name one example. But at the same time, although it supports the AU and VST formats, it isn't packed with processing options of its own. That said, it does feature three excellent technologies from iZotope: 64-bit SRC (sample rate conversion), MBIT+ dither and SonicFit time/pitch. Wave Editor can load and save in most of the common uncompressed formats (AIFF, WAV, Wave64, SDI, SDII, ACID, and Apple Loops). Couple that with import and export in many further file formats, including MP3, Apple Lossless, FLAC, Ogg Vorbis, CAF and REX, and you have pretty much all bases covered. What's more, it also handles multichannel audio in the same channel-independent way - that is, whether you're editing the left channel of a stereo audio clip or the left surround channel in a 5.1 file, the procedure is the same. Although Wave Editor's interface appears typical at first glance, it actually works using a system of layers. These are a key operational aspect of Wave Editor. 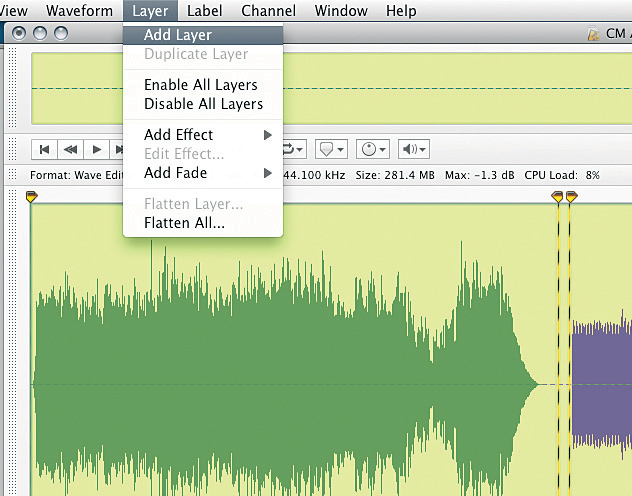 When adding, editing or combining audio, layers act like independent regions, but afford you much more flexibility. 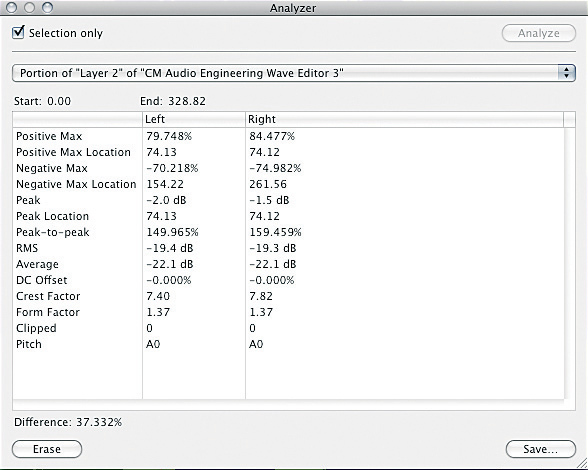 In essence, a layer can have its own effects, fades, sample rate, file format, bit depth and channel count. What's more, unlimited layers can be stacked on top of each other or dragged and arranged in a more linear fashion, like a CD master. There's even a master layer for global effects. If you're looking for a visual analogy, Adobe Photoshop uses a very similar concept - you'll even find a 'flatten' function for rendering your final file. Typical GUI functions, such as drag and drop of regions, are combined with the 'layers drawer' that appears to the side of the main window. In the list area, you can select effects and layer-combining options. In addition to the obvious 'add' setting for mixing layers, there's also 'duck' (ducks one layer according to the level of another) and 'subtract' (ie, polarity inversion). The great advantage of this system is that you can compile from a variety of file types, only committing to a rendered file when you're ready. This layering methodology is complemented by a system called SmartEdits that enables you to further divide layers into smaller sections with their own fades, levels and colours. All these aspects are saved within the app's proprietary WEDT session format. Of course, once you've 'flattened' your session, you can save or export in any of the supported file formats. Wave Editor includes a number of extra tools, floating windows and customisations. The most interesting is File First Aid, which is designed to view, diagnose and repair corrupt audio files. Next up, you've got the file analyser. This gives you a breakdown of a healthy file, including peak position and level, RMS and average levels, and details of any clipping incidents. Offline processing options include pitchshift, timestretch, gain, reverse, sample rate conversion, normalise and a 'thresholds' option for chopping up files based on transients. Other features include a basic file recorder and tone generator, and you can enhance the workspace with three meters: Level, Stereograph and Spectrograph. Finally, you can customise not only the key commands, but also the behaviour of your mouse's scroll wheel. Given its slightly individual approach, you might think that Wave Editor would take a lot of getting used to, but once you've grasped the layers concept, it's all pretty straightforward from there onwards. If you do need a little help, though, the manual is excellent, and assuming you're connected to the web, the support page includes a number of 'screencast' tutorials, as well as access to email support. After some time working with Wave Editor, what's most surprising is just how customisable the workspace is. You can drag and rearrange many aspects of the screen and even rejig the information bar entries. Various aspects, such as colours, waveform types and labels, can be changed. Plus your current workspace setup can be saved as a template. There are also context-sensitive menus on the right mouse button, adding considerably to the overall ease of use. "You might think that Wave Editor would take a lot of getting used to, but once you've grasped the layers concept, it's all pretty straightforward." If you're planning to use Wave Editor to produce CD masters, this is also pretty easy. You can load files onto consecutively arranged layers, and additional metadata, such as CD Text or ISRC and UPC codes, can be added via the properties window. Track markers can be dragged in using the Label Well to the right of the Waveform Bar, and there's also support for indices. The only real caveat is that once you've done all of this, you will have to flatten the layers before burning, and this can take a while. As mentioned, as well as burning a Red Book CD, you can also export your master in the DDP format. How useful DDP is to you depends on the kind of manufacturing plants you're dealing with, but its inclusion will no doubt please some, and it's good to see this technically superior option in such an affordable program. Possibly of more widespread interest is the option to export cue sheets and PQ sheets (the latter in HTML format). 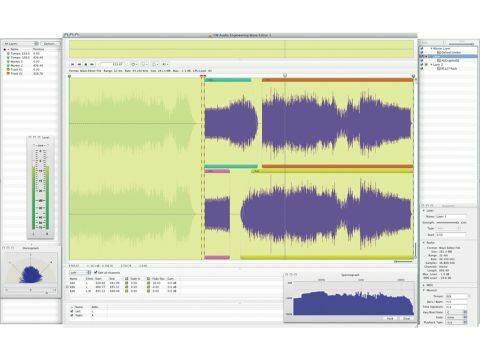 Wave Editor isn't jam-packed with extras, so if you need bells and whistles, such as mastering processors or audio restoration capabilities, you'd be best off with one of the 'heavyweight' audio editors. However, if you're after a solid editor with excellent CD mastering capabilities, we feel that this program is excellent value and well worth checking out.